We all have dreamed dreams. Some have been realized; others await fulfillment. Do you have a dream? Is there something you are anticipating? I love children’s dreams about virtually unlimited possibilities of doing and becoming. As youth, dreams form around making the team, being chosen for a lead role, getting a driver’s license or reaching autonomy. Years pass and new dreams encompassing marriage, owning a home and starting a family take greater shape. Later in life, minds fill with dreams of retirement and less toil. Man was created with an innate ability to dream! It is evidence of being formed in the image of God — the One who envisioned and spoke all things into being. Dreams enable us to reach beyond today’s reality, pushing present boundaries toward what could or might be. I remember well the excitement and anticipation with which each of our sons approached marriage. Filled with far-reaching plans and joyful hope, the future held promise. I’m sure Joseph was much the same. How long his betrothal to Mary lasted, we aren’t sure. In the custom of the time, he would begin to prepare a house for his future wife and family as soon as he was engaged. I cannot imagine the upheaval of emotions that filled Joseph when he discovered Mary’s pregnancy: anger, betrayal, disbelief, fear, anxiety, confusion, disquiet. He watched helplessly as his greatest dream shattered irreparably before him. Where did he go so wrong? Wasn’t he faithful to God? Hadn’t he tried to follow the Lord? How could this happen? Why? The weight of disappointment and hurt must have been unbearable! Despite his personal pain, Joseph chose to act with the same integrity and honour that previously marked his life. Joseph prepared himself to protect Mary regardless of any backlash! Undoubtedly, others questioned his sanity in making such a choice. Nonetheless, Joseph’s faithfulness and integrity blazed forth in spite of his own doubt and confusion. His dream died a brutal death! Time to cut the loses! Walk away! What do you do when dreams shatter like broken glass on a concrete floor? Walking away may seem easy, even logical. The dark disintegration of man’s expectation is the perfect atmosphere for God’s revelation, igniting hope from hopelessness. Things are not always as they appear. Mary is pregnant but not because of unfaithfulness. 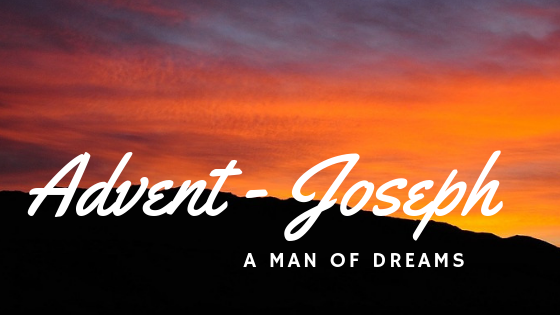 If Joseph was confused before, this dream may have intensified rather than answered the questions dominating his thoughts. Could this be possible? Was God really going to entrust him, a carpenter, and Mary, an unknown maiden, with the raising of the Messiah? Every parent feels the overwhelming sense of responsibility that surrounds the birth of a child. How much more these parents and this birth? Joseph’s preset pattern of obedience to God set him in motion. Secure in his identity, he didn’t break his stride when faced with circumstances that would topple most men. On the basis of only a dream, he took immediate action. In the midst of shattered dreams, obedience demands strength and resolve. He drew deep from the well named “Trust in God”. The steadiness of a man’s steps prove the soundness of his faith! Joseph was far more than a carpenter. God spoke to his identity: “son of David“, a man with a heart after God! There was nothing normal about this marriage. Perhaps there never would be! At some point Joseph had to make peace with his reality. There was no jubilant wedding night or honeymoon — two becoming one flesh. A trip to Bethlehem, an untimely birth, strangers coming with well wishes and surprising announcements, prophetic utterances in the temple, more strangers with gifts and homage …. each confirming the identity of the Holy Child. The dream of having a “normal” life died a thousand deaths! The desire for a secure home for Mary and Jesus probably remained foremost in Joseph’s heart — to provide for and protect his household. Just when things seemed to begin to take shape, another dream! appeared to Joseph in a dream. and his mother and escape to Egypt. Get up! Escape! Sounds more like a nightmare than a dream! Would Joseph ever experience the luxury of “normal”? Maybe! But not today! The same outright obedience that had marked Joseph’s life to this point continued. His steadfast faithfulness to both God and his family were enough to stir him from deep sleep. Packing their few belongings, they moved on. Before the awakening of dawn, there came a fresh realization that perhaps the worst was not yet behind them. They became refugees on the run! I am amazed as I consider Joseph, this incredible man of God. What an example of unshakable faith in God’s sovereign will. Wherever God led, however long the exile, regardless of questions, Joseph led his family with faith. What kind of man walks with consistency at such great personal sacrifice? God knew Joseph could be trusted along every rocky road of this journey. God’s only Son was safe in the hands of this loving, passionate servant. Is faith blind, or does it see without light? Is the breaking of a dream the end, or the beginning of something beyond understanding? Can you imagine the relief? At home with the threat over! Safe at last! When one says “yes” to God, there is no way of knowing where “yes” will lead. “Yes” is unconditional agreement to God’s choice, God’s ways, His thoughts, His desires. The path of “yes” is often paved with sacrifice. I have learned much from looking at the life of this not-so-secondary character in the Advent story. Each of us, at some point, will face the reality of broken dreams, failed promises, and unrealized hope. Then, what? May God see in us, what He saw in Joseph, a true son of David — one “who will do everything” He desires.